In 1901 the successful artist E. A. Hornel (1864–1933) purchased Broughton House, a substantial 18th-century building in Kirkcudbright's main street. Before moving there, he employed his friend John Keppie in December 1900 to design a studio overlooking the garden at the rear. 1 Keppie seems to have done this in a private capacity: the drawings are signed 'John Keppie Archt.' (though they are inscribed with the practice address of John Honeyman & Keppie, 140 Bath Street), and there is no mention of the studio in the practice job book. Its footprint is shown on the 1:2500 O.S. map surveyed in 1907 and published in 1908. 2 In 1909, Hornel commissioned a further addition, a richly appointed picture gallery above the stable and coach house, forming a link between the original house and the studio. This time the job was carried out in the name of Honeyman, Keppie & Mackintosh and was fully recorded in the firm's job book. The gallery is top-lit via a flat, glazed ceiling, and the walls have mahogany panelling with plaster casts of the Parthenon frieze above. Dominating the room is an elaborately carved stone chimneypiece in 17th-century style. There is also a small window recess with seats, set behind a carved wooden screen. Because of the slope of the site, the floor level of the gallery is a full storey higher than that of the studio, but a staircase within the studio connects the two rooms. 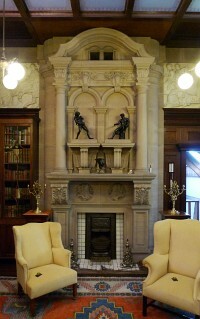 Authorship: There are compelling reasons to believe that John Keppie designed the Broughton House picture gallery: he was a personal friend of the client and had already designed his studio; moreover, the baroque style of the chimneypiece is close to his 1906–7 design for the Parkhead Savings Bank. The chimneypiece was carved by Holmes & Jackson, who had also worked for Keppie on the Parkhead bank and on the grand Hope Street tenement which he designed for Glasgow Corporation around the same time. There is no evidence that Mackintosh had any involvement with Broughton House. 1: Kirckudbright, Stewartry Museum (Dumfries & Galloway Museums service): Plans of proposed studio for Broughton House, STEWM:1991.06. 2: O.S., Kirkcudbrightshire, 1:2500, 1908, Sheet LV.01.